It is based in Mumbai. One thing I liked about the Company is that you can order online through Company website. But there was one major drawback as well the website does not have enough information about Company itself. Lets first look at absolute return Company gave over the years. It was trading at 13 INR mark in year 2002. Now it is trading at 130 mark in year 2018 end. So that is 10 times return in 16 years. It is good return by all standard. So people have made money in this counter over the years. One thing I liked about the price chart. It does not have any sudden decline in prices except in year 2008 due to global crisis. It shows that Company performance was either flat or growing at slower pace than market expectation. After year 2008 crisis it did went into consolidation mode for quite sometime. During that period prices kept on declining slowly and then during the recent bull run it gave good returns to investors. Granites are becoming popular in India and abroad. It deals with Granites, Marbles and Gemstones. The fashon trend of Gemstones is returning. From being a stone to bring fortune they are now used as style statement as well. This is second company from this sector in portfolio of Subramian P. The other company was Divyashakti granites. Divya Shakti also gave very good return over the years. 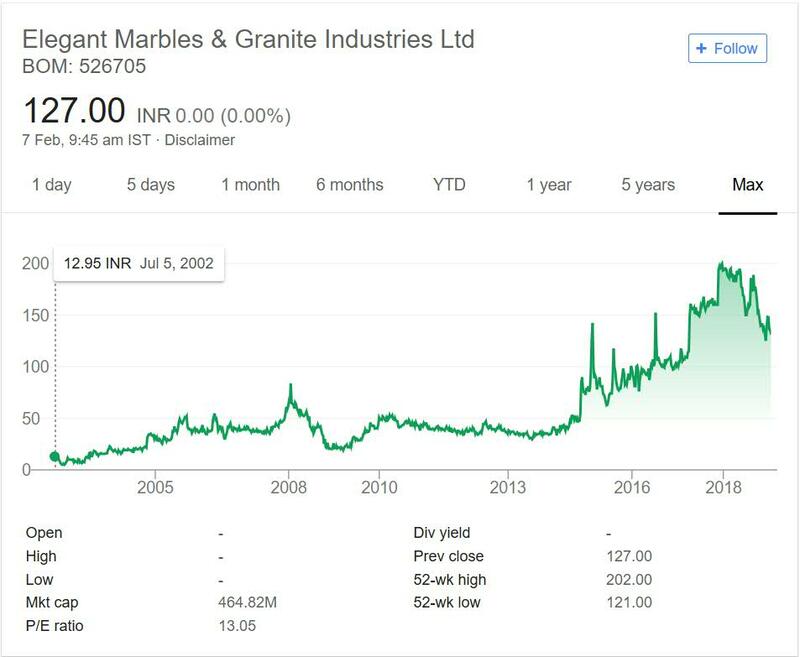 I am bullish on Tiles and granite sector. People have started to use them heavily on their construction. They are regarded as style statement nowadays.